The local members of the Paediatric Rheumatology International Trials Organisation (PRINTO) participating in the project are listed in the dedicated tables no. 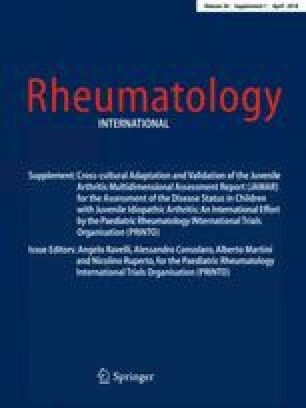 2 and 3 of “ https://doi.org/10.1007/s00296-018-3944-1 / Cross-cultural adaptation and psychometric evaluation of the Juvenile Arthritis Multidimensional Assessment Report (JAMAR) in 54 languages across 52 countries: review of the general methodology”. The aim of the present study was to cross-culturally adapt and validate the Finnish parent, child/adult version of the Juvenile Arthritis Multidimensional Assessment Report (JAMAR)  in patients with juvenile idiopathic arthritis (JIA). The JAMAR assesses the most relevant parent/patient-reported outcomes in JIA, including overall well-being, functional status, health-related quality of life (HRQoL), pain, morning stiffness, disease activity/status/course, articular and extra-articular involvement, drug-related side effects/compliance and satisfaction with illness outcome. This project was part of a larger multinational study conducted by the Paediatric Rheumatology International Trials Organisation (PRINTO)  aimed to evaluate the epidemiology, outcome and treatment of childhood arthritis (EPOCA) in different geographic areas . We report herein the results of the cross-cultural adaptation and validation of the parent and patient versions of the JAMAR in the Finnish language. The methodology employed has been described in detail in the introductory paper of the supplement . In brief, it was a cross-sectional study of JIA children, classified according to the ILAR criteria [5, 6] and enrolled from March 2012 to October 2013. Children were recruited after Ethics Committee approval and consent from at least one parent. a question about satisfaction with the outcome of the illness (Yes/No) . The JAMAR is available in three versions, one for parent proxy-report (child’s age 2–18), one for child self-report, with the suggested age range of 7–18 years, and one for adults. The process of cross-cultural adaptation was conducted according to the international guidelines with 2–3 forward and backward translations. In those countries for which the translation of JAMAR had been already cross-culturally adapted in a similar language (i.e., Spanish in South American countries), only the probe technique was performed. Reading comprehension and understanding of the translated questionnaires were tested in a probe sample of ten JIA parents and ten patients. Each participating centre was asked to collect demographic, clinical data and the JAMAR in 100 consecutive JIA patients or all consecutive patients seen in a 6-month period and to administer the JAMAR to 100 healthy children and their parents. The statistical validation phase explored the descriptive statistics and the psychometric issues . In particular, we evaluated the following validity components: the first Likert assumption [mean and standard deviation (SD) equivalence]; the second Likert assumption or equal item–scale correlations (Pearson r: all items within a scale should contribute equally to the total score); third Likert assumption (item internal consistency or linearity for which each item of a scale should be linearly related to the total score that is 90% of the items should have Pearson r ≥ 0.4); floor/ceiling effects (frequency of items at lower and higher extremes of the scales, respectively); internal consistency, measured by the Cronbach’s alpha, interscale correlation (the correlation between two scales should be lower than their reliability coefficients, as measured by Cronbach’s alpha); test–retest reliability or intra-class correlation coefficient (reproducibility of the JAMAR repeated after 1 or 2 weeks); and construct validity in its two components: the convergent or external validity which examines the correlation of the JAMAR subscales with the six JIA core set variables, with the addition of the parent assessment of disease activity and pain by the Spearman’s correlation coefficients (r)  and the discriminant validity, which assesses whether the JAMAR discriminates between the different JIA categories and healthy children . Quantitative data were reported as medians with 1st and 3rd quartiles and categorical data as absolute frequencies and percentages. The complete Finnish parent and patient versions of the JAMAR are available upon request to PRINTO. The Finnish JAMAR was fully cross-culturally adapted from the standard English version with three forward and two backward translations with concordance in 109/123 translation lines (88.6%) for the parent version and 108/120 lines (90%) for the child version. Of the 123 lines in the parent version of the JAMAR, 122 (99%) were understood by at least 80% of the 10 parents tested (median = 100%; range 40–100%); 119/120 (99%) lines of the patient version of the JAMAR were understood by at least 80% of the children (median = 100%; range 70–100%). Line 114 of parent version of the Finnish JAMAR and line 111 of the child version were modified according to parents/children suggestions after the probe technique. A total of 173 JIA patients and 100 healthy children (total of 273 subjects) were enrolled at five paediatric rheumatology centres. In the 173 JIA subjects, the JIA categories were 1.2% with systemic arthritis, 46.2% with oligoarthritis, 39.9% with RF-negative polyarthritis, 0.6% with RF-positive polyarthritis, 0.6% with psoriatic arthritis, 7.5% with enthesitis-related arthritis and 4.0% with undifferentiated arthritis (Table 1). A total of 265/273 (97.1%) subjects had the parent version of the JAMAR completed by a parent (165 from parents of JIA patients and 100 from parents of healthy children). The JAMAR was completed by 217/265 (81.9%) mothers and 48/265 (18.1%) fathers. The child version of the JAMAR was completed by 222/273 (81.3%) children aged 6.8 or older. In addition, patients younger than 7 years, capable to assess their personal condition and able to read and write, were asked to fill in the patient version of the questionnaire. The JAMAR results are presented in Table 1, including the scores (median (1st–3rd quartile)) obtained for the PF, the PhH, the PsH subscales and total score of the HRQoL scales. The JAMAR components discriminated well between healthy subjects and JIA patients. In summary, the JAMAR revealed that JIA patients had a greater level of disability and pain, as well as a lower HRQoL than their healthy peers. The main psychometric properties of both parent and child versions of the JAMAR are reported in Table 2. The following “Results” section refers mainly to the parent’s version of findings, unless otherwise specified. For all JAMAR items, the median number of missing responses were 0.6% (0.0%-0.6%). The response pattern for both PF and HRQoL was positively skewed toward normal functional ability and normal HRQoL. All response choices were used for the different HRQoL items except for items 1, 2, 4, 6, 8 and 9, whereas a reduced number of response choices were used for all the PF items except for item 4. The mean and SD of the items within a scale were roughly equivalent for the PF and for the HRQoL items, except for HRQoL item 5 (data not shown). The median number of items marked as not applicable was 0% (0%-0%) for the PF and 1% (1%-6%) for the HRQoL. The median floor effect was 92.7% (89.7–93.9%) for the PF items, 69.7% (61.2–75.2%) for the HRQoL-PhH items, and 68.5% (67.3–69.7%) for the HRQoL-PsH items. The median ceiling effect was 0% (0–0%) for the PF items, 0.6% (0–2.4%) for the HRQoL-PhH items, and 0% (0–0.6%) for the HRQoL-PsH items. The median floor effect was 40.6% for the pain VAS, 33.9% for the disease activity VAS and 34.5% for the well-being VAS. The median ceiling effect was 0% for the pain VAS, 0% for the disease activity VAS and 0% for the well-being VAS. Pearson’s items–scale correlations corrected for overlap were roughly equivalent for items within a scale for 93% of the PF items, with the exception of item 4 and for 80% of the HRQoL items, with the exception of items 1 and 7. Pearson’s item–scale correlations were ≥ 0.4 for 73% of items of the PF (except for PF items 11, 12, 13 and 15) and 100% of items of the HRQoL. Cronbach’s alpha was 0.82 for PF-LL, 0.81 for PF-HW, 0.45 for PF-US. Cronbach’s alpha was 0.83 for HRQoL-PhH and 0.81 for HRQoL-PsH. The Pearson’s correlation of each item of the PF and the HRQoL with all items included in the remaining scales of the questionnaires was lower than the Cronbach’s alpha. Reliability was assessed in eight JIA patients, by re-administering both versions (parent and child) of the JAMAR after a median of 6 days (range 6–7 days). The intraclass correlation coefficients (ICC) for the PF total score showed an almost perfect reproducibility (ICC = 0.98). The ICC for the HRQoL-PhH and the ICC for the HRQoL-PsH showed an almost perfect reproducibility (ICC = 0.94 and ICC = 0.91, respectively). The Spearman’s correlation of the PF total score with the JIA core set of outcome variables ranged from 0.2 to 0.5 (median = 0.4). The PF total score best correlation was observed with the parent assessment of pain (r = 0.54, p < 0.001). For the HRQoL, the median correlation of the PhH with the JIA core set of outcome variables ranged from 0.2 to 0.7 (median = 0.4), whereas for the PsH ranged from 0.04 to 0.4 (median = 0.1). The HRQoL-PhH showed the best correlation with the parent’s assessment of pain (r = 0.74, p < 0.001), while the HRQoL-PsH showed the best correlation with the parent global assessment of well-being (r = 0.49, p < 0.001). The median correlations between the pain VAS, the well-being VAS, and the disease activity VAS and the physician-centred and laboratory measures were 0.3 (0.2–0.4), 0.3 (0.2–0.4), 0.4 (0.2–0.5), respectively. In this study, the Finnish version of the JAMAR was cross-culturally adapted from the original standard English version with three forward and two backward translations. According to the results of the validation analysis, the Finnish parent and patient versions of the JAMAR possess satisfactory psychometric properties. The disease-specific components of the questionnaire discriminated well between patients with JIA and healthy controls. Psychometric performances were good for all domains of the JAMAR with few exceptions: 4 PF items (”Stretch out arms”, “Put hands behind neck”, “Turn head and look over shoulders” and “Bite into a sandwich or an apple”) showed a lower item internal consistency. However, the overall internal consistency was good for all the domains, except for PF-US that is poor. In the external validity evaluation, the Spearman’s correlations of the PF and HRQoL scores with JIA core set parameters ranged from weak to moderate. The results obtained for the parent version of the JAMAR are very similar to those obtained for the child version, which suggests that children are equally reliable proxy-reporters of their disease and health status as their parents. The JAMAR is aimed to evaluate the side effects of medications and school attendance, which are other dimensions of daily life that were not previously considered by other HRQoL tools. This may provide useful information for intervention and follow-up in health care. In conclusion, the Finnish version of the JAMAR was found to have satisfactory psychometric properties and it is, thus, a reliable and valid tool for the multidimensional assessment of children with JIA. We thank all families who participated in the project, the team that prepared and reviewed the forward and backward translations, and all members of PRINTO in Finland. We thank the staff of the PRINTO International Coordinating Centre in Genoa (Italy) and in particular Marco Garrone for the overall coordination of the translation process, Silvia Scala and Elisa Patrone for data collection and quality assurance, Luca Villa, Giuseppe Silvestri and Mariangela Rinaldi for the database development and management and the remaining PRINTO team for data entry. The principal investigator of the study was Prof. Angelo Ravelli, MD. The scientific coordinator and study methodologist was Nicolino Ruperto, MD, MPH. The project coordinators were Alessandro Consolaro, MD, PhD, Francesca Bovis, BsA. We also thank Prof. Alberto Martini, PRINTO Chairman. Funding was provided by the Istituto G. Gaslini, Genoa (Italy). Permission for use of JAMAR and its translations must be obtained in writing from PRINTO, Genoa, Italy. All JAMAR-related inquiries should be directed to printo@gaslini.org. Permission for use of CHAQ- and CHQ-derived material is granted through the scientific cooperation of the copyright holder ICORE of Woodside CA and HealthActCHQ Inc. of Boston, Massachusetts USA. All CHQ-related inquiries should be directed to licensing@healthactchq.com. All CHAQ-related inquiries should be directed to gsingh@stanford.edu. This study was funded and coordinated by Istituto Giannina Gaslini, Genoa, Italy. Dr. Ruperto has received Grants from BMS, Hoffman-La Roche, Janssen, Novartis, Pfizer, Sobi, during the conduct of the study and personal fees and speaker honorarium from Abbvie, Ablynx, Amgen, AstraZeneca, Baxalta Biosimilars, Biogen Idec, Boehringer, Bristol Myers Squibb, Celgene, Eli-Lilly, EMD Serono, Gilead Sciences, Janssen, Medimmune, Novartis, Pfizer, Rpharm, Roche, Sanofi, Servier and Takeda. Dr Lahdenne, Dr Vahasalo and Dr Kroger report funding support from Istituto Giannina Gaslini, Genoa, Italy, for the translation and data collection performed at their sites within the EPOCA project. Dr. Consolaro, Dr. Bovis, Dr Malin, Dr Aalto, Dr Rebane, Dr Putto-Laurila and Dr Saila have nothing to disclose. Informed consent was obtained from all individual participants included in the study as per the requirement of the local ethical committee.